Officials are asking for help to identify the feet. Human feet have been eerily washing up on shorelines across Canada's westernmost province for over a decade. On Monday, the British Columbia Coroners Service appealed for the public's help in identifying the latest foot, which was discovered inside a light gray Nike sneaker on a rocky beach in West Vancouver in September. "The BC Coroners Service is asking for any information people may have related to the shoe or to whom it may have belonged," the office said in a statement Monday. "The decedent was wearing a light grey Nike Free RN shoe with a black Nike swoosh logo and white base, white laces and a blue sock. The shoe was a men’s U.S. size 9.5 with an OrthoLite insert. The shoe was manufactured between Feb. 1 and April 17, 2017." The West Vancouver Police Department, which is working with the British Columbia Coroners Service, said no evidence at this point indicates a death resulting from foul play. "Our primary objective in working with the coroners service on this matter is to provide closure for family of the individual," Cst. Jeff Palmer, a spokesperson for the West Vancouver Police Department, told ABC News on Thursday. 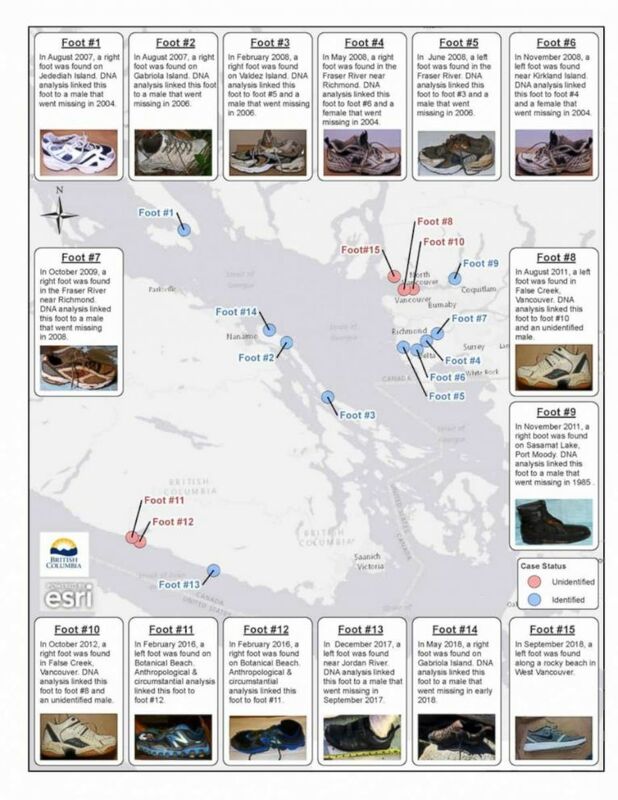 (British Columbia Coroners Service) An infographic shows where human feet have been found on British Columbia shorelines since August 2007. Ten have been linked to missing persons in which no criminal involvement was suspected, while the other five remain unidentified, police said. Several have been confirmed as pairs, according to the coroners service. When asked for comment, a spokesperson for the coroners service, Andy Watson, told ABC News that the office "takes pride in our role in identifying the deceased in any fact-finding death investigation conducted by coroners." "The coroners service determines who died, how, where, when and by what means," Watson added. "In this investigation with a foot washing up on a shoreline, our goal is to determine the identity of the deceased to help bring closure for a family grieving the loss of a loved one."